The title of this article gives rise to a little thought – Secrets of Strength. Are there any secrets, hidden forms of exercise, little known facts about the source of power and its development? Or is everything connected with the science of strength and development as clear as crystal, as the pages of an open book? Actually there are NO secrets about anything. Everything there is to be known is right here for us to reach out and grasp. All we have to do is find it, search it out, discover it for ourselves. There is an old proverb to the effect that some people “cannot find the wood for the trees.” The blindest are those who REFUSE to see. All exercises, routines, schedules and systems of training are variations on one basic theme. Nothing is new! Everything has been done before – either by Man or by Nature. Just take the miracle of birth and the tragedy of death. These are constants occurring every second of the day and night, in hundreds of different ways and circumstances, yet they still boil down to simply being born and dying. The same with weight training. You get a different twist, an improvement, a new angle on some old, well established exercise. It’s the same movement, yet another way of performing it. And it never fails to produce a loud chorus of, “Why, we knew that all the time. So and so introduced that YEARS ago and I did such and such a poundage on this or that day.” These are the cries of the envious – those with no gumption of their own to go exploring, resenting those who have the moral guts to tread new paths. The descent to abuse and ridicule of ANY new idea in ANY field is made by those who cannot stay abreast of worthwhile developments, who lack the foresight to visualize development itself. These people are quick to condemn and swift to ridicule. Criticism is of top importance and the search for truth last on the list. Before they think of experimenting they first abuse, condition their minds to the contrary – and so an innovative way of performing a basic movement is to them a mere novelty, a fad, simply because they didn’t have the sense to think of it for themselves. One of the greatest enemies of successful weight training is boredom – grinding along, day after day, week in and week out on the same routines and exercises. There is a similar parallel in the matter of food. Even dry bread tastes wonderful when you are starving, while bread and cheese is a feast for the hungry. When a man first enters the ranks of lifters any form of exercise suffices, because his body is starving for it, demands it. But the steady diet of orthodox movements gradually becomes more and more monotonous and the body and mind give up in disgust and boredom. And here is the time for you to start eating the steak and onions of exercise, the delicious dish of development through specialization. This article’s lift – The Abdominal Raise – is known throughout the world as the Sit Up. It is used by thousands in the mistaken belief that it is the best exercise for producing that washboard appearance on the front of the torso. When you tell fellows that it isn’t REALLY an abdominal exercise, they look at you as if you were nuts. The rectus muscles of the abdomen DO NOT “jack knife” the body. Their function os to prevent the trunk from TOPPLING BACKWARDS at the WAIST and to ROLL the torso onto the PELVIS. 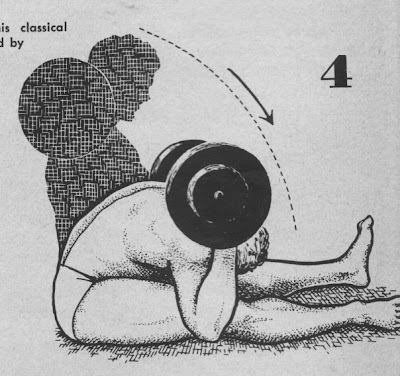 The action of raising the trunk up and down to the legs is performed by the Psoas Illiacus muscles and the Abdominal group are called into play in the sit up “in preparation” for the eventuality of “falling back.” In other words, they act as brakes which clamp on when the body travels DOWN to the ground. You can easily determine the truth of this statement by sitting with a fairly heavy weight and noticing the PULL on the lower spine, then LOWERING the trunk to the ground as SLOWLY as you can. These articles are intended not only as guides to the actual lift, but also as routines – specialization routines. I first started the series to try and settle the disputes that raged over the correct way to do curls, supine presses and other exercises – and at the same time, give some course of movements that would improve those feats of strength. I have tried to keep to this as much as possible. I have strayed at times and make no apology for this, because it is impossible to stay on any straight and narrow exercising path. You have to wander a little to make things interesting . . . Let me do a little straying now. 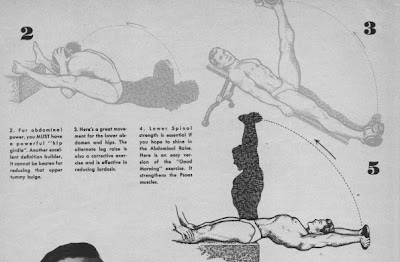 The best “sit up” I ever heard of was performed by Frank Leight, with a poundage of around 150 pounds, a terrific feat of strength if ever there was one. Edward Goodman of Los Angeles, an attorney by profession, was another outstanding performer on the abdominal raise, lifting 107 ½ pounds at a bodyweight said to be around 147 or so – I do not vouch for the accuracy of these particular figures. The British record in the 169 pound class through to the heavyweight is 114 ¾ pounds. None of the above athletes displayed outstanding abdominal development – that is, their PUBLISHED pictures evidenced no terrific abdominal musculature. That same evidence was also provided by the sit up endurance king. Holding the world record for the number of consecutive repetitions one would think that he would be possessed of an outstanding torso both in shape and definition. The reverse was true. He had ABSOLUTELY NO DEFINITION at all, and quite a little “pot” to his lower abdomen. So first, let me give you the rules of the Abdominal Raise, and then a schedule of exercises that will not only improve your Sit Up record but will also give you plenty of abdominal development. These rules are very simple. All you have to do is keep the knees locked – that is, the thighs straight – rigid – with the bar touching the body throughout the lift. Exercise 1. Sit on the end of an exercise bench with your legs stretched out in front of you. Hold a LIGHT weigh across the back of your shoulders. From this position lower your body down and BACK until it touches the bench. Relax here. This is your starting position for the exercise. From here raise the body up, over and DOWN until you touch the thighs. Raise your trunk from here BACK to the commencing position. You will find it best to have a training partner hold your feet, or secure them under a weight on the floor. Use a light weight until you have the exercise off “pat,” then take a poundage you can handle for 2 sets of 10 reps. Work up to 2 sets of 20 reps before increasing the poundage. Other important points in this exercise are to keep the chin tucked down onto the chest, and the lower back rounded as you raise yourself from the bench to upright position. There you have another version of the old sit up. Exercise 2. A good strong hip girdle is essential if you hope to increase your sit up poundage. This exercise will help you considerably. Again the use of an exercise bench is necessary. 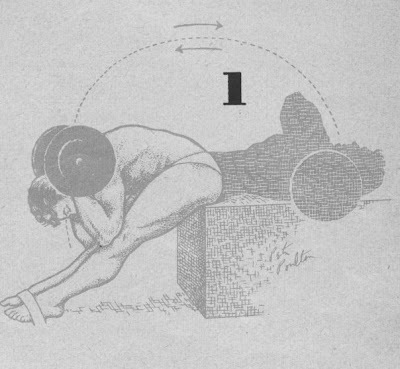 Lie on the ground in front of the bench and rest your feet on it, as shown in the illustration by Peter Poulton. The feet should be about 18 inches apart. Hold a DUMBELL at the back of your neck. Point the elbows UP. From this position raise the trunk UP and then DOWN between the thighs, trying to touch in as close to the crotch as you can. DON’T bend the knees – DO keep the legs STRAIGHT. Force yourself down between the legs, than return to the commencing position and repeat. Use a weight you can handle for 2 sets of 8 easy reps and work up to 2 sets of 15 reps. The 15th rep should see you JUST able to make it and the abdominal muscles aching. Exercise 3. For strengthening the lower abdomen, this movement is unbeaten. Again we have a new version of a very old exercise. Attach weight to or strap two iron boots onto your feet. Lie on an abdominal board – your head at the high part and your feet at the bottom of the board. Reach over your head and clasp hold of the board’s top. From this position – thighs stretched out along the board – raise the legs ALTERNATELY as far up and OVER as possible. Try and touch the head of the board with each toe as the leg is raised. Point the toes as the thighs are lifted off the board. Try and keep your back flat as much as you can, allowing the lower part to curve only in order to reach back as far as you can with your feet. Start with a poundage you can handle for 3 sets of 10, working up to 3 sets of 20 reps. Exercise 4. Here is an “easy” version of the good morning exercise, one that will help strengthen the spine for sit ups. Seat yourself on the ground with a barbell of dumbell across the back of the shoulders. From this position, lower the trunk until you touch your thighs. Relax. This is your commencing position. From here, raise the trunk to the upright position, lower and repeat. Start off with a light poundage until you are able to perform the movement correctly, then use a weight out of which you can get 2 sets of 8 reps, working up gradually to 2 sets of 15 reps. Keep your legs straight throughout this exercise.